Encounter is a prayer ministry. 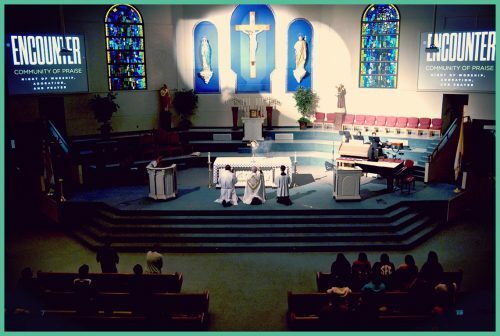 It is an experience of praise, worship, and Eucharistic Adoration. It is free and open to all! Christ comes to dwell with us in the Eucharist. In the Blessed Sacrament, He goes to the extreme limits of love, humbling Himself to the appearance of bread and wine, in order to remain with us and be our Bread of Life. In Adoration, we are able to abide with Him, to simply be in His presence and offer ourselves to Him. Adoration is heaven on earth, where here in the world, we are drawn up into the presence of Jesus – our victorious savior, who will let nothing separate us from His love. God created us body and soul, and we are called to worship Him with our whole selves, body and soul. Through praise and worship, our souls cry out for God. In our singing, we pour our hearts out to Him, in thanksgiving, in petition, in love. Our posture reflects this. We stand in victory before Him. We kneel in humility. We raise our arms in surrender. We open our hands, asking God to come fill us with His life and His love. In praise and worship, we give all that we are, honestly and humbly, to the Creator of heaven and earth.